Our Oxygenating therapeutic facial corrects and prevents free radical damage, as oxidative and environmental stress of skin is a significant contributor to aging. The Oxygenating Facial stimulates oxygenation and circulation within the skin, rejuvenating sluggish, stressed or acne affected skin as it draws oxygen to the skin’s surface, resulting in a radiant, healthy glow. This Oxygenating facial produces no stinging or irritating side effects. However, a rosy flush and rapid warm sensation to the skin is normal. 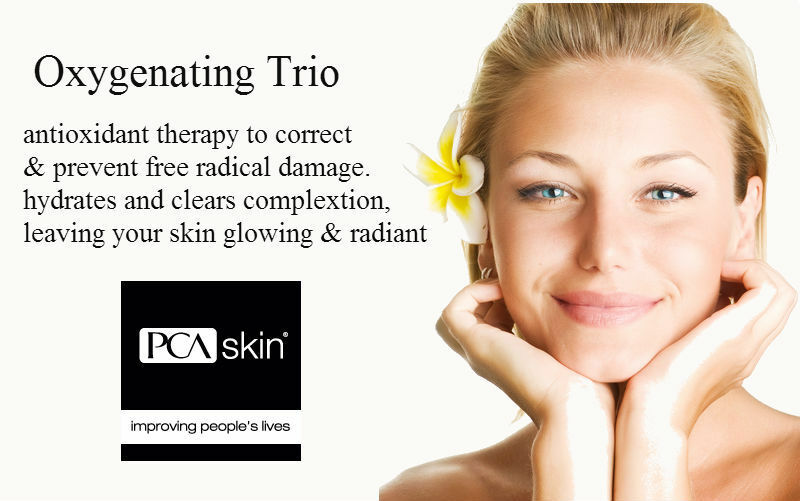 Oxygenating treatments leave the skin radiant, with a healthy look that will last seven to ten days. Benefits: Promote healing and rejuvenates sluggish, stressed skin depleted by toxins, pollutants, allergens, improper diet and solar damage. Acneic conditions also benefit greatly. Appropriate for use between peel treatments or when exfoliation or flaking is not desired. This treatment is also ideal two to three days before a special event. It draws oxygen to the skin’s surface, producing a rosy flush and a rapid warming sensation, resulting in a radiant, healthy look that lasts up to ten days. The skin benefits as moisture molecules bond to the tissues causing a gentle plumping of the skin. Ingredients: A combination of superoxide dismutase(an enzyme that supports antioxidant defense), fumaric acid (antioxidant) , Niacinamide ( Vitamin B3 that hydrates and promotes clear skin), hydrolyzed candida saitoana extract (encourages skin detox) and stabilized hydrogen peroxide( provides antioxidant therapy to stimulate oxygenation and circulation, revitalizing damaged skin by bringing oxygen to the surface).AHA (Lactic & Glycolic Acid ) and BHA (Salicylic Acid) reduce inflammation and promote exfoliation, while also providing essential hydration.